I love reading plays and collections of short plays are right up my alley. Not too long ago I read and reviewed a similar book (5-Minute Plays for Teens) by the same editor. This collection takes on the occasional more mature theme or just features older characters than the previous collection. Oddly enough, however, unlike the teen edition, not a single short play really stood head and shoulders above the rest for me. Some stood out as being slightly more interesting to me than others (A Very Short Play About the Very Short Presidency of William Henry Harrison by Jonathan Yukich and Modern Art Modeling by Rod McFadden) and only one struck me as particularly dreadful (The Psychic’ Convention by John McKinney). Most, however, were tremendously average. But what do you expect from only five minutes worth of theatre? I was never a fan of the ten minute play, which maintains a strong fascination in the small theatre world, and I like the five-minute play even less. We don’t get to know characters, but rely on stock characters and/or a setting to define who the characters are. We’re thrust into the last moments of a conflict and really only get the ‘punch line’ of a story. This is a collection of play after play of ‘surprise revelation’ and it does get tedious. Short plays are great for theatres … more plays means more cast members which means more families coming to see them which means more cash at the box office. But I wouldn’t pay money to see a series of five or ten minute plays. I would, however, spend money to READ five and ten minute plays. I’m glad to have read this, and if I hadn’t I would have been wanting to read it. However, having now read both this edition and the teen edition, I’m more likely to encourage readers to check out the teen edition for more interesting stories. I’m likely to use both editions when I (very rarely but occasionally) teach play-writing. Looking for a good book? 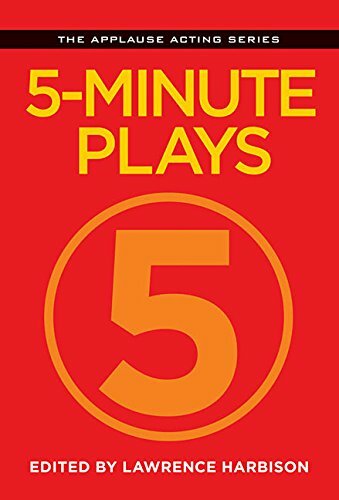 5-Minute Plays, edited by Lawrence Harbison doesn’t contain many outstanding plays. An author or two shows promise, but nothing here will likely make the reader wish they were seeing the play live.